There are 15 reviews of Beach. This is a simple scent, and those who tire easily of jasmine or who have a low tolerance for white florals in general may find it just a little bit cloying after a while. It's not entirely linear, though: after a few hours, the flat mineral smell of dry sand finally puts in an appearance -- I had thought that it wasn't going to show at all, but just when I'd given up on the 'sand' note, there it was! The other beachy scents the notes claim, however, elude me. I can't smell any salt water or sea breeze in here at all. That's okay, though: the suntan lotion associations are strong enough that my imagination can halfway fill them in for me anyway. As beach nostalgia scents go, I far prefer the photorealism of At the Beach 1966, but this is certainly a cheerful summery fragrance, and I'm sure that it will bring a smile to many faces. I see others complaining about longevity, but on me this lasted a good long time -- certainly long enough to see me through an 8-hour workday -- and it stays politely close to the skin. I'm a guy who usually prefers more masculine scents (fahrenheit) as well as soapy ones, and I love to rock this. I think it is a unisex smell. Yes, it really does smell like coppertone! Depending on your tastes, that's a good thing or bad. In my case, it's good. 4 stars, but could easily be 5 if it weren't for the high price tag and short longevity. Either way, guy or girl, check it out. I tried CB I hate perfume (at the beach 1966) because I was told it smelled exactly like coppertone...but BOBBI BROWN BEACH is the one that nailed it. CB's version is too cucumbery and after awhile, kind of nauseating. Bobbi Brown BEACH nailed the classic old scent of coppertone perfectly. I tried the Demeter suntan lotion perfume as well...a total fail. If you LOVE the way your skin used to smell after using coppertone suntan lotion, then you will LOVE this fragrance. There is nothing closer to the smell of the original coppertone suntan lotion back in the day. Amazing summer scent and winter pick me up! For the novelty and nostalgia, this gets a thumbs-up. It smells like a trip to the beach when I was a kid and everyone had on Coppertone. The longevity of this scent on my skin is for crap, though. To call it "fleeting" would be generous. Also - do I really want to smell like a trip to the beach on a regular basis? Probably not. Love Beach! Beach smells similar to the modern Coppertone, but not the same. It actually smells just like the old Coppertone Cocoa Butter (the solid kind they used to make). I was reading something about how Coppertone was developed in 1944 by a pharmacist named Benjamin Green and it was cocoa butter combined with jasmine (the "sea jasmine" note I guess). It's such a nostalgic scent - reminds me of sunny summer days, pools, beaches, wearing bikinis and cut offs, etc...just being young and having fun! For me, this was a pure nostalgia purchase, a fragrance that, just like it does with everyone else, reminds me of my childhood spent on the Adriatic coast "bathing" in Coppertone, salty water and orange blossom scent from the air. I like to wear this fragrance over the summer weekends. Probably not a fragrance for a professional office (especially if you have to wear suits), but for those moments when you let your hair loose and wear flip-flops, just beautiful. I can see pinkmimosa's point, I do believe men are attracted to this fragrance for subconscious reasons. I was debating "should I or should I not" smell like Coppertone, but there are moments when any other fragrance is just too much and this is just perfect. So I treated myself to a bottle. There are no member images of Beach yet. Why not be the first? 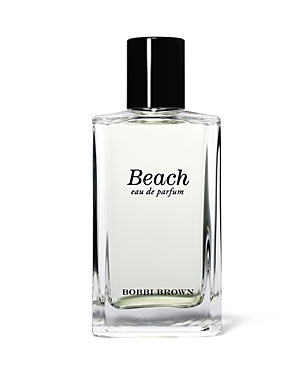 "Beach" by Bobbi Brown: Unisex enough to wear?